Celebrate the 50th anniversary of Topps Mars Attacks! Trading Cards! Features an attacking Martian with a street-scene base and a melted victim. Paint and glue required for final assembly. Celebrate the 50th anniversary of Topps Mars Attacks! Trading Cards with this excellent Mars Attacks! 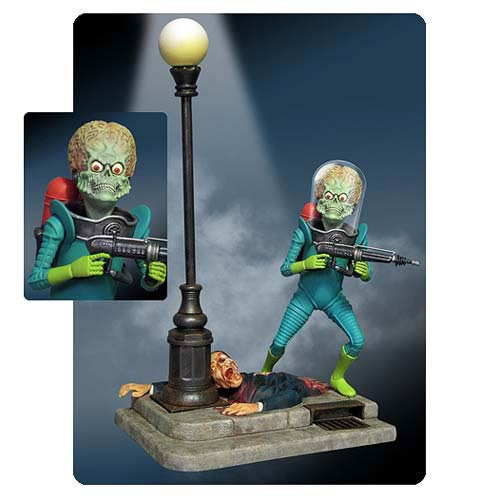 Martian Figure Model Kit that features an attacking Martian with a street-scene base and a melted victim. Approximately 1:8 scale, the Mars Attacks! Martian Figure Model Kit needs paint and glue for final assembly. Don't we all... Ages 15 and up.